If you are on your way to Stuttgart to attend an event, you can consider yourself to be more than lucky to be visiting this beautiful German city. Stuttgart, the automotive capital of the country, is the sixth biggest city in Germany and is home to almost 600.000 people. 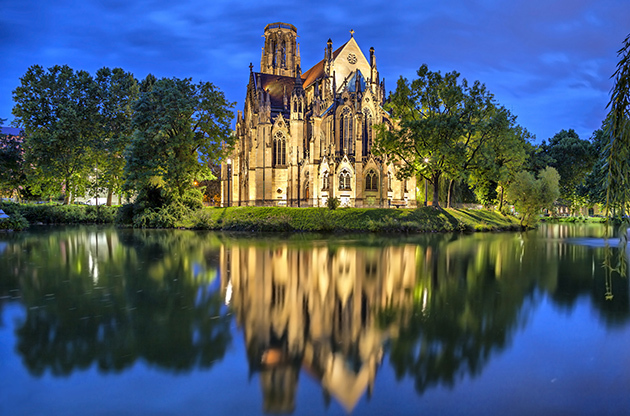 Located in the south of Germany, Stuttgart is the capital of Baden-Württemberg. Although usually referred as the “'cradle of the automobile”, Stuttgart doesn’t fail the visitors who want to see different shades of green since the city has got not only numerous parks but also vineyards and valleys. Stuttgart offers the visitors a large number of attractions to choose from. These includes famous sights and museums to see, shopping areas that suits all types of interests, upscale restaurants and exciting excursions. The city has managed to establish a historical layer on its own way after the Second World War. During the war, most of the buildings were collapsed because of the heavy bombings and due to that, historical buildings are not abundant in the city. However, after the reconstructions that went hand in hand with preserving the surviving ones, Stuttgart gained that unique atmosphere it still has got today. If it is going to be your first time in Stuttgart, you are going to experience a traditional German city life which is beautiful and neat. If it is going to be your second visit, then you will once again get the chance to admire Stuttgart, where spending some time, no matter what your purpose is, is always delightful. Located on the southwest of Germany, Stuttgart is the biggest and capital city of the Baden-Württemberg state. How to get to Stuttgart? If you are flying to Stuttgart, you are going to arrive in Stuttgart Airport that is in Leinfelden-Echterdingen. The airport is located 13 km south of the Stuttgart city center. You can use train, bus, subtrain and taxi to reach the Stuttgart city center. More information can be found on the official website of Stuttgart Airport. How to get around in Stuttgart? Stuttgart has got one of the most efficient local transportation systems in the whole country. If you have made a trip to Germany before, you may already be familiar with U-Bahn and S-Bahn. These are the two major lines you will probably be using during your trip if you want to use the public transportation. In addition, the bus service is also another mean of transportation you can use. During the weekdays, U-Bahn and S-Bahn work until 1:00 A.M. but in the weekdays the local transportation service is 24 hours. You can get all the information you may need from the Stuttgart Information Center’s official website. Stuttgart may seem to be just a regular city at first but it does offer a lot to the visitors. If you are into museums you are going to find at least a couple to spend hours in. The city is also great for the shopping enthusiast. No matter if that is upscale stores or more local shopping experience you are after, Stuttgart is going to keep you satisfied and you may end up with needing an extra luggage to take back the things you buy. This trip to Stuttgart is also going to be one of the tastiest ever since the city is filled with enough number of places to try local German dishes that are mouthwatering. When you get back home from Stuttgart, the first question you’ll receive from your friends is probably going to be, “Have you been to the gigantic Mercedes Benz Museum?” If posing with Eiffel in sight when in Paris is a must, then visiting the Mercedes Benz Museum in Stuttgart is too. If you are museum enthusiast and want to get more, then you can visit Kunstmuseum Stuttgart, Württembergisches Landesmuseum or Porsche Museum. All of these are rich in content and will satisfy your hunger to discover something new. There are also major points of interest you shouldn’t miss when you are in Stuttgart. For example, Altes Schloss, in other words, the Old Palace is among the iconic buildings in the city. In addition to Princes' Building (Prinzenbau), Wilhelmspalais (King William's Palace) and Fernsehturm Stuttgart (TV Tower) are among the other things that make Stuttgart this beautiful. You are going to see that shopping in Stuttgart is easy since the city offers the visitors a compact shopping experience. The main shopping area is Königstraße, right next to the main railway station. You can find brand stores as well with local ones side by side located on the street. Königstraße is also a great choice for the ones who want to discover the inner city since it leads to the center. If you would like to discover some shopping malls in Stuttgart, you are offered a bunch options to choose from once again. Milaneo, Galeria Kaufhof and Breuninger are the most famous three and you are going to find what you want in these for sure. If you want to buy something local from the city to remember the time you spend here when you go back home, you may have a look at the merchandise stores of VfB Stuttgart. After a day packed full of meetings, Stuttgart will take care of you well if you want to relax and enjoy the city in a good quality restaurant or a bar. There are plenty of places you can choose from and Stuttgart is one of the cities in Germany that has got a shiny night life scene. When in Stuttgart, you may want to give a try to Swabian food since it is still widely served in the restaurants, especially by the hotel and guest house restaurants. Kebab is famous in Stuttgart just as it is the other cities in Germany because of the number of Turkish people living in the city. However, if you want to try something from the world cuisine, once again you may choose from the countless restaurants that serve Italian, Chinese, Greek or Indian. If you would like to grab a drink after your dinner or listen to some good music or dance, then the street you should head to is Theodor-Heuss-Straße. Theodor-Heuss street is the rising star of the night life in Stuttgart since a large number of bars and pubs has been opened there in the recent years. Stuttgart has got a number of seasonal festivals and if your trip falls on the same dates with any of those, you should definitely check them out. For example, the wine festival that is held 10th of September in ever year is a great attraction and it is participated by not only visitors but also locals. If you have a free day and if you want to see something other than the Stuttgart city center, then you may discover the beautiful Ludwigsburg that is located only 12 km from the Stuttgart city center. There are 3 castles in Ludwigsburg which will make you feel you are in a fairy tale that has been set in early 1900’s. Since Stuttgart lies in the middle of Baden-Württemberg, you may take the chance of visiting some of the world’s best vineyards. There are daily tours you can take from Stuttgart to taste the wine, enjoy the scenic view and learn more about the vineries. Stuttgart is an important city not only in Germany’s but also in Europe’s business scene. Every year, countless congresses, conferences, trade shows, fairs and symposiums are being held in the city. Good quality hotels and venues that are equipped to meet the needs of the attendees contribute to the success of Stuttgart on becoming one of the important hubs for international events.